Hive is a brilliant product for disabled people. Once the Hive hub is connected to your broadband modem many different products can be connected to it and controlled via an app on a mobile phone. 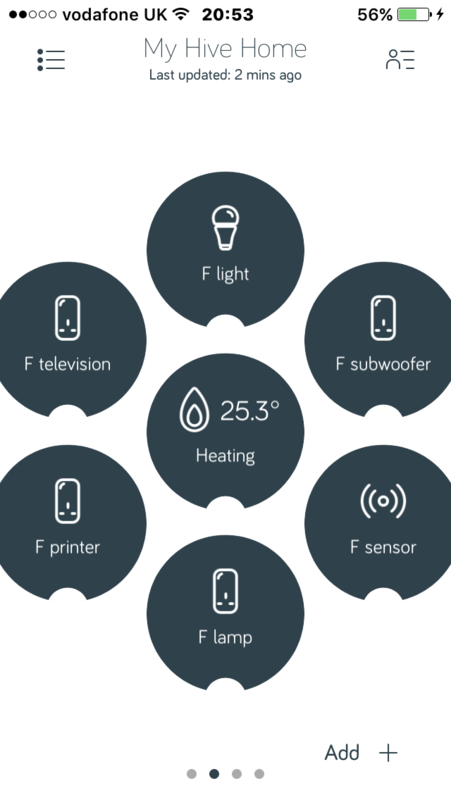 For instance I have a Hive Active Heating Kit which allows me to control the heating from my mobile phone, Hive Plugs which allow me to turn off and on my adjustable bed, microwave, oven, fans, televisions, lamps, USB plug, printer, exercise bike, standing frame and dryer. I also have Hive Lights which allow me to switch on, off and dim my bedroom, hall, bedroom and spare room lights. In fact most of these lights and plugs are on timer so they turn on and off automatically at a certain time which makes my home even easier to control. I also have Hive Sensors which detect and alerts me to any movement within my home at night time. This is my Hive app. I've used the prefix 'F' for devices in the front room; 'K' for devices in the kitchen; 'B' for devices in my bedroom; 'S' for devices in the spare bedroom; and 'H' for devices in the hall.